TennSMART, a Tennessee-based consortium, brings leaders together from the public, private, and academic sectors to accelerate the development and deployment of intelligent mobility innovations. The company leads mobility research by providing information sharing platforms for organizations and individuals seeking to advance transportation technology and bring efficient new models to market. TennSMART wanted to see how they can use new technologies to increase road efficiency and safety. One possibility, known as platooning, enables vehicles to travel very closely together, safely at high speed. However, platooning will only have an industry impact if the supporting technology is widely accepted. To accelerate adoption of this technology, TennSMART needed a platform to provide data visibility for different parties to have access to research, analysis and technology deployments. TennSMART needed a platform where autonomous vehicles could stream data and consortium members could access the sanitized data insights to help accelerate truck platooning across the state. SoftServe developed a PoC that can be rolled up to MVP and prove that SoftServe’s Intelligent Mobility Platform (IMP)—powered by Google Cloud—is a solid technical foundation for future TennSMART data platforms. TennSMART engaged SoftServe to create a data platform and clearinghouse that would demonstrate immediate business value to the consortium members. The proof of concept (PoC), proposed by SoftServe, outlined an approach that would give TennSMART the ability to gather, process, and disseminate relevant data and insights. 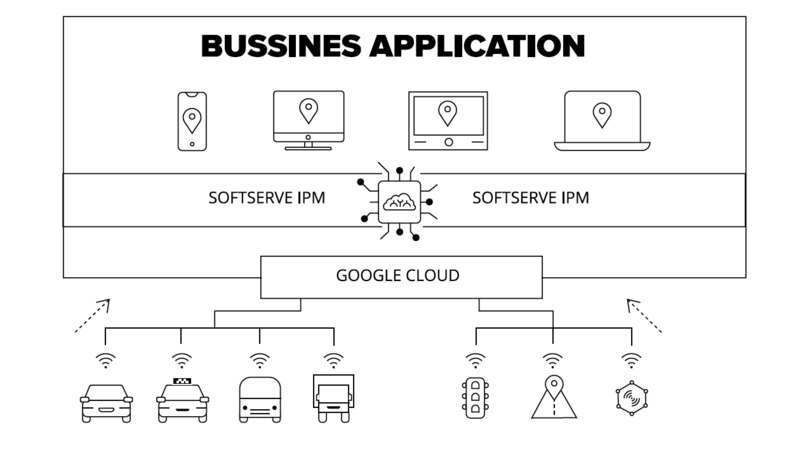 SoftServe recommended its Intelligent Mobility Platform (IMP)—powered by Google Cloud—as the foundation for the new data platform. This approach would give TennSMART the ability to monitor platooning trucks in real time and access data insights for optimal platooning parameters in order to make valuable, data-driven decisions. This gives platform users the ability to support any device, connection method, data format, and business logic by writing high-level IMP applications and deploying them to the platform without having to make modifications to the platform. Also, the platform was designed to handle future IoT devices, data formats, large data volumes, and security. Delivered a PoC using SoftServe’s IMP, which can be extended and operationalized as a solid foundation for future revisions of the TennSMART data platform. Presented the vision and developed a prototype that will support future platooning applications. The prototype, which leveraged SoftServe’s IMP, was exposed to a large audience—including the Tennessee Department of Transportation and the TennSMART consortium members—accelerating discussions about future mobility and commercial investments in mobility concepts and directions.